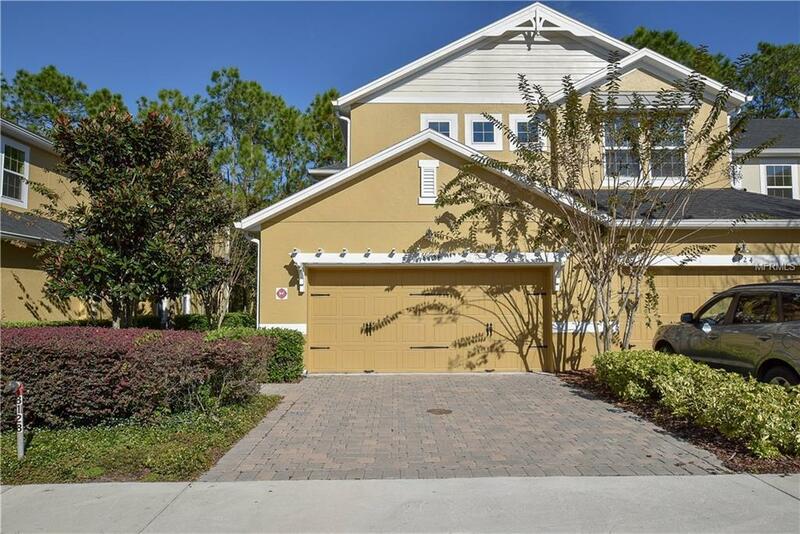 Located in a gated community, this end unit townhome with two-car garage has a beautiful wooded view in the back and a water view in the front. Overlooking the dining and living room, the kitchen offers stainless steel and black appliances, granite countertops, wood cabinets with crown molding, and a breakfast bar. A sliding door provides access from the dining room to the rear lanai where you can relax in privacy with no rear neighbors while enjoying the peaceful view. The master suite features a walk-in closet, dual sink vanity, garden tub and walk-in shower. The other two bedrooms are spacious and share the second full bath. The community offers resort-style amenities including a pool, clubhouse, fitness center, walking trail, and playground, all within minutes from Walt Disney World Resort. RENT INCLUDES CABLE, WATER/SEWER, TRASH AND EXTERIOR PEST CONTROL! !